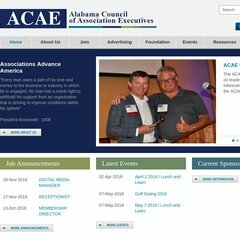 Topics: Acae, Cae's, Committees, Past Presidents, Renewal Form, and Job Annoucements. It is hosted by Adobe Systems Inc. California, using Microsoft-IIS/7 web server. Its 3 nameservers are ns02.onlinebusinesssuite.net, ns03.onlinebusinesssuite.net, and ns01.onlinebusinesssuite.net. The site is programmed for ASP.NET.